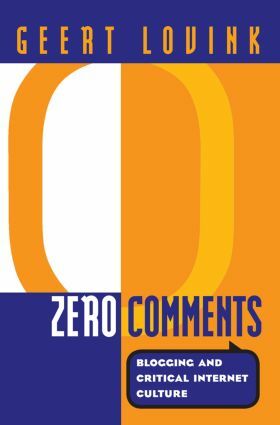 In Zero Comments, internationally renowned media theorist and 'net critic' Geert Lovink revitalizes worn out concepts about the Internet and interrogates the latest hype surrounding blogs and social network sites. In this third volume of his studies into critical Internet culture, following the influential Dark Fiber and My First Recession, Lovink develops a 'general theory of blogging.' He unpacks the ways that blogs exhibit a 'nihilist impulse' to empty out established meaning structures. Blogs, Lovink argues, are bringing about the decay of traditional broadcast media, and they are driven by an in-crowd dynamic in which social ranking is a primary concern. The lowest rung of the new Internet hierarchy are those blogs and sites that receive no user feedback or 'zero comments'. Zero Comments also explores other important changes to Internet culture, as well, including the silent globalization of the Net in which the West is no longer the main influence behind new media culture, as countries like India, China and Brazil expand their influence and looks forward to speculate on the Net impact of organized networks, free cooperation and distributed aesthetics.